It will be a Reading Week like no other for a group of students from Wilfrid Laurier University. Thirty hours on a bus each way. Hard work. No pay. And the experience of a lifetime. The Collegiate Challenge is a long-running annual trip organized by WLU Habitat for Humanity, one of the largest and most active campus-based Habitat for Humanity chapters in Canada. 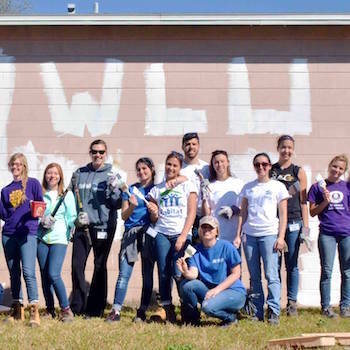 This year, more than 30 members of the club are heading to Laredo, Texas, to help build affordable homes for – and with – people in need. Though the club would like to try a trip within Canada in the future, to date the trips have always been to a southern U.S. state, which in recent years have included Alabama, Florida and Georgia. The Collegiate Challenge tradition is so strong at Laurier, it made a Huffington Post top 10 list for extracurricular activities at Canadian universities. This year, the students leave on Saturday, Feb. 17 and return Sunday, Feb. 26. While they’re in Laredo, they’ll stay in a church basement and mostly do their own cooking. They’ll work from 8:30 a.m. to 3:30 p.m. every weekday. Working with the students will be some of the families who will benefit from new homes. The families have to put in “sweat equity” by working on Habitat houses, whether their own or other people’s, as well as complete home ownership classes. Club executive members say meeting some of these families has been a highlight of past trips. The students aren’t necessarily experienced builders – and that’s okay. There’s plenty of on-the-job training and support, as well as opportunities to work on projects at different stages of completion, ranging from pouring foundations to painting. It’s not all work and no play. The trip includes time for fun – this year, the students will visit a virtual reality arcade and stop at the beach in Corpus Christi on their way home. However, the students say some of the most memorable experiences are the impromptu ones that result in group bonding – whether it’s a chicken-nugget-eating contest or just hanging out. The club helps people at home, too. Members regularly participate in local builds with Habitat for Humanity Waterloo Region. They also organize fundraisers, ranging from bake sales to silent auctions. “It helps Laurier students give back to the community where we get our education,” says Philip. "The fact that we can go to school and get an education and at the end of the day, go home and have a roof over our heads, it’s really an amazing thing. There’s a lot of work that goes into that." Philip, Pouramn and Romero say being involved with Habitat has taught them invaluable skills. Not only do they feel more confident about the prospect of becoming homeowners one day, they have learned teamwork and organizational skills they expect will help them in their future careers. Though it’s too late to get in on this year’s trip, Laurier students can join in next year’s Collegiate Challenge by filling out an application form. A maximum of 48 students can go – in some years there’s a waiting list. The club fundraises to offset the cost of trip, but participants pay a substantial portion, which can range from $500 to $700 per person. For more information or to get involved with Habitat for Humanity’s local activities, contact the Laurier club through Facebook.